For years , I was clueless on what fun I was missing on Deepavalli. This time when we were all set to prepare some ladoo and murukku , I started to feel the festive mood already. Sometime in the yesteryears, my mom's gulabjamun was rigid with a sugarcoat and badushah was dripping the sugar syrup like gulabjamun should . Not that it stopped me from slipping down half a dozen of both the sweets. Ready mix for Gulabjamun was a news back then. Its only after the invasion of Krishna sweets mysurpa and ananda bhavan , most people lost the taste of the celebrations, ironically.Its the home-made rava ladoo, Maa ladoo, Murukku , adhirasam, thattai,gulab jamun, badushah , prepared for friends a week ahead of Deepavalli and the apetising aroma you feel while you are in the queue in a grinding mill that makes you relish every bite of the festival preparations. The smell of the fire works was deliciously scary to the little girl that I was. I started with pottu pattasu , kuruvi, laxmi, doubleshot and graduated to 150 wala. Bijilis and roll caps were for the deepavalli afternoon and for the week or the holidays that follow. Sparklers , flowerpots, Butterfly, golden whistle, chattai and chakras were saved for the night sky. I confess here that I have never tried a rocket in my life. This time 2 bags of fireworks (all funky ) were given to me for free, but I dint feel like lighting them(vayassayiduchi... :D) ,I politely declined.Simply was watching people have fun , the varieties of fireworks released year after year never ceases to amuse me. I dont think special programmes on the TV ever caught the attention of the kids.Some comedy plays with catchy titles try hard , but the timing sucked. They were always scheduled during the time of saravedis. Deep-avalli as the name implies is a row of lights.We light lamps to invite the goddess of light, hope , peace and prosperity .We pray to seek her blessings . Lighting rows and rows of lights is destined for Karthikai deepam in our homes. On Deepavalli ,we light lamps only in the pooja room like every other day. but the prayers performed would be significant o' significant unlike other days. While a row of lights running in the balcony is a north Indian custom, they wish 'Happy Diwali ' . We say 'Happy Deepavalli ' but we hardly light 2 lamps in the entrance , that too for the oothubathi and mathaapu to burst the crackers and light the fireworks. While their lights glow all night. 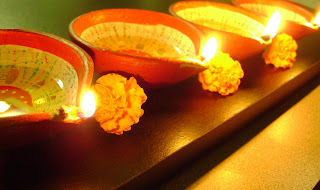 To us , putting a kolam and lighting lamps meant the same thing on every other day as well. Anyways,that never stood in the way of exchanging sweets and greetings. Blame it on the diversity of my country. On second thoughts , snacking on an eclectic taste of murukku and ladoo (surprisingly all prepared with the same recipe :p ) on Deepavalli , feasting on 'Nombu kanji ' and Mutton biriyani on a Ramzan , cherishing a Christmas cake and Chicken Biryani on a Christmas is a luxury , only my motherland has to offer. //Deep-avalli as the name implies is a row of lights.We light lamps to invite the goddess of light, hope , peace and prosperity .We pray to seek her blessings . Lighting rows and rows of lights is destined for Karthikai deepam in our homes. neenga entha oorla irukeenga?? indiava? ila abroada? Ok u the first ! 1 week munnadiye build up irukkulle athaithaan sonnein bha..
biryani option ey illaatha ungalukku enna confusion ? paesama ladoo murukku saapdunga..
SKS , AB illainu thaane sontha muyarchi la ladoo senjom..
nala damayanthi moviela oru airport scene varume ...athu mathiriya? Paravaale , Deepavalli thaane ladoo finish aaguravaraikkum ellaarukkume undu.. Thanks annam , naan apdi laam inime solla koodaathunu evlo pheel aagureenga .. u r very sweet! ?? ?entha oornu keta enna solirukeengannay purila! !